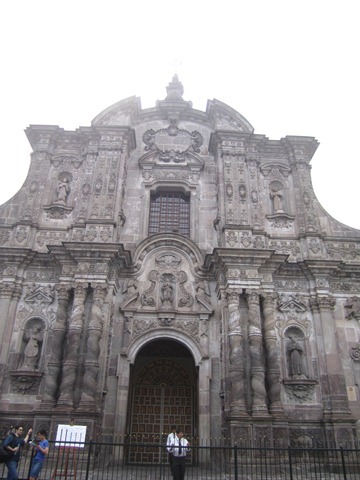 After the gorgeous Galapagos Islands, Hubs and I travelled to Quito, the capital of Ecuador. 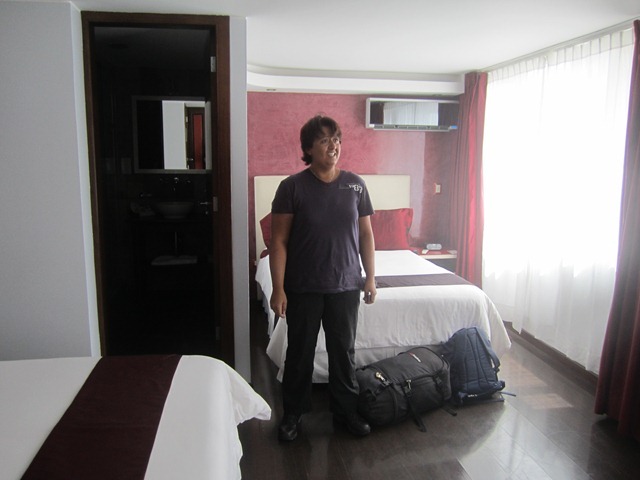 We arrived late in the afternoon and had a booking at the Sierra Madre Hotel in the Mariscal district (the lively district). After an early dinner in Plaza Foch, we were tucked up in our room, reading and watching TV by 7.30pm. 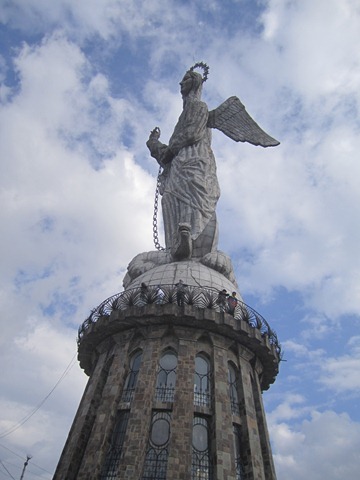 Everyone had told us, including the trusty Lonely Planet, that Quito was a dangerous city at night. 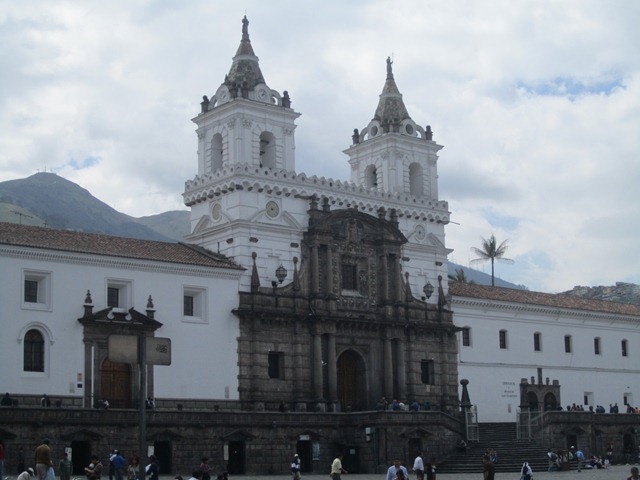 We were advised not to walk around with handbags and never to walk around after dark – even short distances – taxis in Quito are cheap and we were told to take taxis everywhere. As an example, a taxi from the airport to our hotel was US$6. We were both in the mood for an early night and not in the mood for tackling a big dangerous city. I was sleeping quite soundly when I heard a really loud crash. I woke up, and asked Hubs what happened. Her mattress was sagging to the floor with her bum in it and her legs up in the air – “My bed just broke!!!”. Oh my God – at 3am getting up to fix a broken bed is no fun. She was holding up the mattress and I was trying to place the slats that had slipped out back across the bed frame. I failed – the bed frame was warped, so the slats didn’t reach across properly. As I was attempting to be a good mate and help Hubs out, a slat slipped off the bed frame and landed straight onto her foot. OUCH! Hubba said something like ‘Holy FARK that hurt!! !’ Watching it happen made me wince in pain… poor Hubs. I felt terrible for her – and she understood that was a total accident. Hubs picked up the phone and almost shrieked down the receiver that her bed was broken and could someone come to our room to fix it NOW. The poor night porter didn’t have a hope of fixing the bed, so he offered to put Hubs into another room, the room next door. Hubs used the toilet in that room and it began to over flow. Oh dear. By this time is was about 3.15am. So he moved her to another room, a room without a window. When the night porter left Hubs in her third room which was box-like, she snuck into a big unoccupied room next door that also had a window and slept there. The next morning, I was feeling shattered. After Hubs moved out to another room, the neighbourhood dogs decided to have a barking competition that went on for 45 minutes – at 3.30am!! GRRRR! My ear plugs did nothing to drown out that sound. I finally fell asleep at 5.45am. Around 9.30am, I had a great shower and made the most of it taking forever to wash my hair, scrub my face, etc. An hour or so later, Hubs stumbles back into our room (with her broken bed still broken) complaining that her shower was a trickle and was totally crap. And that was the final straw. We were checking out that day and nothing – not even the offer of a half price room (making it US$30 per night) was going to sway Hubs to stay. We made the mistake (according to my bank balance) the night before going into a boutique hotel in Plaza Foch called Nu House Hotel www.nuhousehotels.com and had a look at a room, just to compare. It was lovely, new, posh, perfect. And it was expensive, no doubt about it. 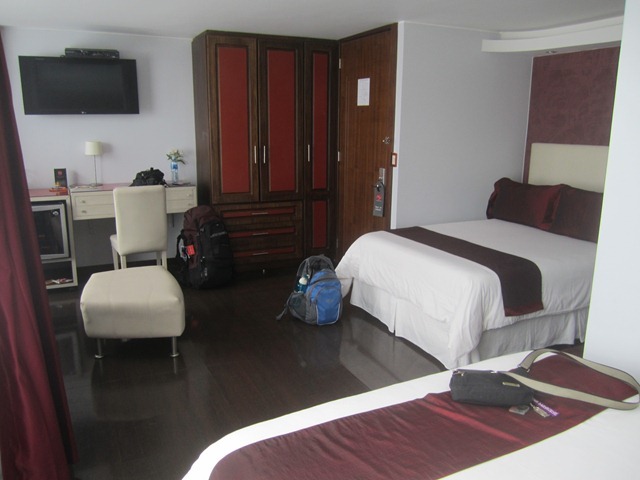 At US$95 per night (discounted from US$120 per night), it was likely to be the most expensive room in Quito. But we didn’t care. We had money and we were not going to ruin our holiday by staying in an under par budget hotel to save a couple of hundred bucks. That’s where Hubs wanted to stay and of course the hotel was so lovely, I couldn’t disagree. I mean, we each had fluffy white robes and a huge flat screen TV and the room was huge. Also there was lovely posh bathroom products which I just love!! On our way to check into our luxurious new digs, we stopped at the Yanapuma Spanish School http://www.yanapumaspanish.org on Calle 20 Dicembre, to check out doing Spanish lessons. It was perfect. One to one lessons at US$7 per hour. Hubs and I decided to share a teacher and do it together and it was $5.50 per hour each. We were booked in for the next four mornings (4 hours each session) and both really excited about it. We spent the afternoon walking around the “old town” and visited the San Francisco Monastery, the oldest Monastery in Quito, and the impressive La Campania cathedral – every inch of the walls and cathedral high ceilings was covered in gold. WOW wow wow. It was a little over whelming, but totally beautiful. 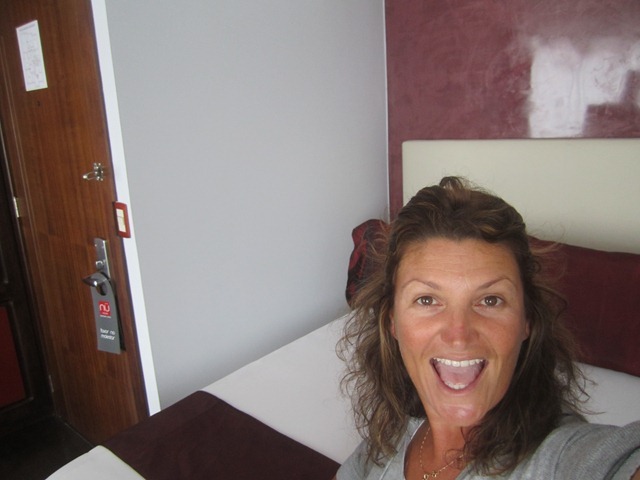 We loved coming home to our “Nu House” – we both had a double bed each – now lovely! !